Michigan State is reportedly suing ESPN in an attempt to withhold a portion of sexual assault reports, filed by university police, from a public records request. The school’s lawsuit stemmed from a request by the Ingham County Prosecutor’s Office, which asked the school not to turn over certain reports, because the prosecutors have yet to determine whether they will press charges against those named in the reports. According to the Lansing State Journal, ESPN’s information request called for Michigan State to turn over “all police reports containing allegations of sexual assault since Dec. 10, 2016, as well as records of arrests made between Feb. 6 and Feb. 9.” The request was filed on Feb. 10, the day after the school announced that three Michigan State players and one staff member, Curtis Blackwell, were suspended pending the results of a sexual assault investigation. On Apr. 24, per the State Journal, assistant prosecuting attorney Lisa McCormick wrote Michigan State’s police department asking them to deny ESPN’s request, reasoning that the office was still determining whether to charge parties involved in the reports. The school has not identified the three players involved; the sole details regarding the alleged assault that have come out is the date when it was reported to have taken place and when it was filed: The assault occurred around 2 a.m. at an apartment complex on Jan. 16, and the woman reported it to the police the next day. Michigan State waited to announce the suspensions of the three players and Blackwell for three weeks, according to another State Journal report. Before publicizing their punitive actions, the Spartans hired a consultant to conduct an internal Title IX investigation by Feb. 2. The consultant was Rebecca Veidlinger, a former Michigan State employee in its Title IX office at a time when the office was being reviewed by the federal government for its responses to sexual assault and harassment complaints. In its press release announcing the suspensions on Feb. 9, the school said the assault took place in “late January.” The next day, the school penned a contract with law firm Jones Day that had been drawn up prior to the suspension announcement, employing the firm to conduct a review of the compliance among its football staff with regards to the allegations. It’s still unclear when the suspensions were actually issued to the players. 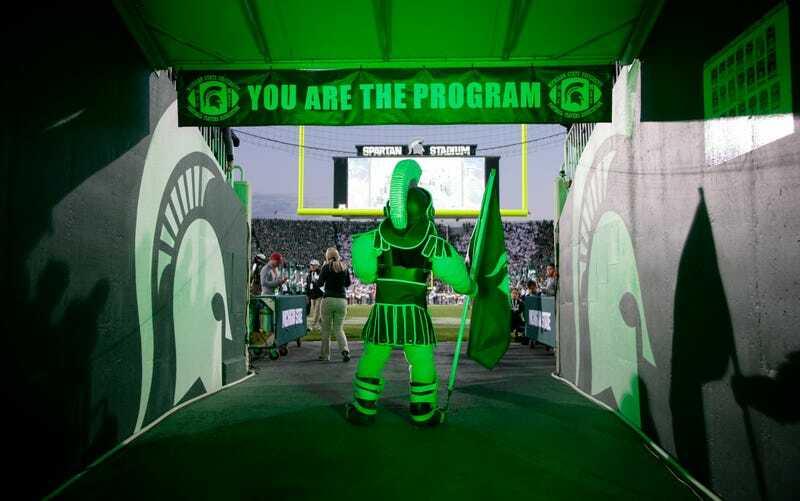 ESPN previously won a public records-related lawsuit against the school in 2015 after Michigan State redacted the names of Spartans athletes that were suspects, witnesses, or victims in a public records request filed by the sports network in September 2014. After ESPN sued the university to make the names public, a judge ruled in its favor, saying that Michigan State had to release the names of those that were named as suspects. The school was ordered to pay a portion of ESPN’s legal fees as a result.